If you're a Penn Department/Center/School, see Almanac's FAQ page to receive Almanac issues through intramural mail. To receive Almanac electronically, simply register with us by e-mail. The service is free. We will electronically notify you when there is a new issue of Almanac, the AT PENN calendar or an 'Almanac Between Issues' item on our website. The e-mail will include teasers linked to the newly posted material. 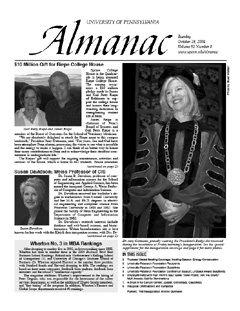 Almanac, published weekly during the academic year and as-needed during breaks, costs $50/year sent First-Class Mail. In a normal year you will receive 33 to 35 issues of the 8.5" x 11", black-and-white journal, ranging from 8 to 20 pages each. In addition to news, official planning reports and uncensored exchanges of opinion, Almanac carries the AT PENN calendar as an 11"x17" center pullout in the issue published on the last Tuesday of each month. AT PENN, the reprint, costs $15/year. There are ten issues (September through May, plus one Summer AT PENN), and they are identical to the pullout in Almanac except that each is on a different color of paper each month. AT PENN lists hundreds of activities—campus exhibits, live music and theater performances, film, children’s activities, academic conferences, talks, and special events—that are open free to the public unless otherwise specified.